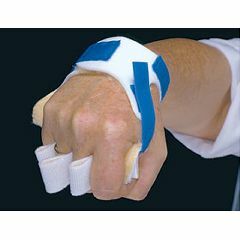 FREEDOM Palm Guard with Finger Separators has all the features of the standard Palm Guard plus finger separators that can be used as loops for maximum stabilization or as interdigital tabs when it's too difficult to thread the loops through fingers. Use with or without a single ¾" MP Extension Roll (like Progressive™ Palm Guard). One size fits all. May be trimmed for smaller hands. Two splints per box. The product does what it says. It protects my son's palms from his fingernails digging in. The trouble is I ordered the wrong hand first! I have nothing to do with the right hand guards. It is not cost effective to return it.. so I lost that. Other than that I am happy with the product itself.